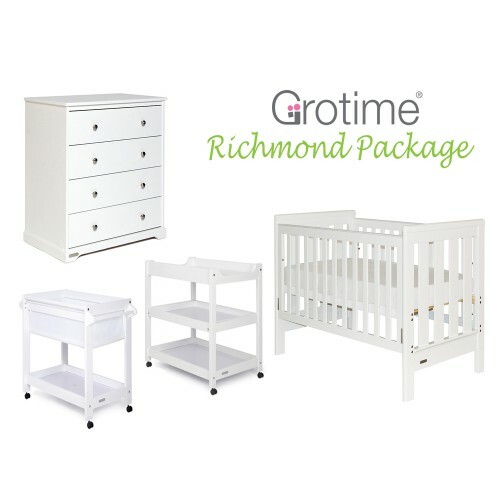 Complete your nursery with this Grotime Richmond Cot Package. The Richmond cot, simple and stylish design to enhance any nursery, modern or classic. Made from solid pine timber from sustainable forests in New Zealand, this solid masterpiece will endure the test of time...a heirloom for you to pass onto your grandchildren in years to come. Our new four drawer chest is the perfect addition to any nursery. With its clean design and topple free system, this unit can also fit the Crest changer top. We know that all parents look for products that offer their little one protection and security, so we designed the Bella changer with that in mind. This sturdy changer has a deep top changing area and we have added a slide out middle shelf for convenience. Your little one is very dependent and needs your constant attention. The Patsy provides a go anywhere sleeping solution. Whether it’s beside your bed at night or with you in the study during the day, your baby is never far from you.